For centuries flowers have been used to communicate a wide array of human emotions and sentiments. Flower symbolism was applied to all the major occasions in life: roses, violets and forget-me-nots for courtship; orange blossom at weddings; and wreaths of cypress at funerals. Once popularised by Queen Victoria, interest in the language of flowers has recently been revived thanks to Kate Middleton and her 2011 marriage to Prince William. 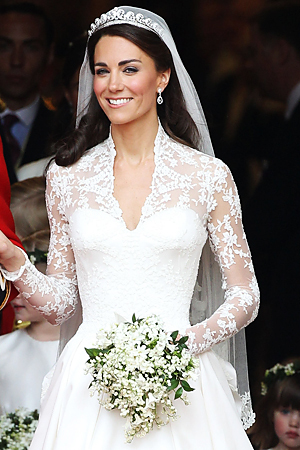 Kate Middleton's wedding bouquet, designed by Shane Connolly, was a shield-shaped wired bouquet of myrtle, lily-of-the-valley, sweet William and hyacinth. The bouquet drew on the traditions of flowers of significance for the Royal family, the Middleton family and on the language of flowers. Kate's bouquet also contained stems from a myrtle planted by Queen Victoria in 1845, and a sprig from a plant grown from the myrtle used in Queen Elizabeth’s wedding bouquet of 1947.